Keywords: avian wildlife casualty; soft tissue injuries; wound management; hydrocolloid dressings; moisture vapour permeable dressings. Only those birds that are likely to make a rapid recovery and be successfully rehabilitated back to the wild should be treated. 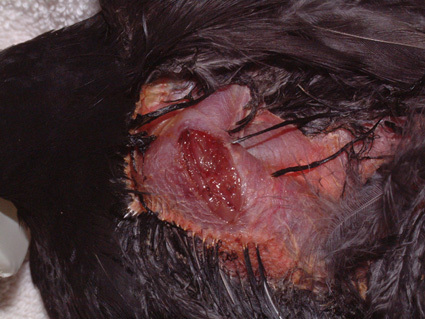 Euthansia should be considered for birds with complex wounds and for those birds that fail to respond to aggressive therapy. The wound management programme must be of a high standard in order to improve the rate and quality of healing and the chances for successful rehabilitation. Hydrocolloids and moisture vapour permeable dressings have been found to greatly improve the quality of avian soft tissue wound management, decreasing wound healing times and complications. The second part of this two-part article discusses the management of a number of soft tissue injuries commonly seen in the avian wildlife casualty. This is not an exhaustive review of avian wound management techniques and problems but serves to illustrate the techniques that can be used successfully to deal with and manage some of the more common presentations. The large number of avian species in the animal kingdom, together with the wide range of presenting problems, makes avian wound management, of necessity, a large and very complex subject. 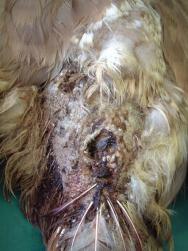 The majority of avian wounds are older than 8 hours and/or contaminated by the time they present for treatment. Most soft tissue healing is therefore by second intention. The flexible properties of certain modern dressings conform well to almost every part of the avian anatomy and the dressings themselves have been found to greatly improve the quality and speed of avian wound healing. This attribute is of particular importance in the wild avian casualty where rapid rehabilitation back to the wild is a key objective. Topical use of a bland preparation containing yeast extract has been shown to stimulate epithelialisation and collagen synthesis for wounds in humans  and canines . Such products are also recommended for use in granulating avian wounds ,  to further speed healing. The principles of wound management in small animals have been well documented , . In the avian species, these principles must be adapted to take into account important differences in anatomy, physiology and pathology . 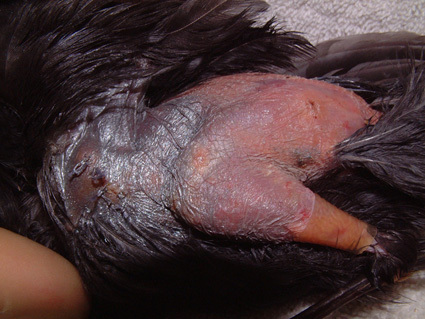 For the purposes of this article, a number of simple techniques used to manage commonly seen avian wounds are discussed. These involve the following wound presentations: beak injuries, head and scalp injuries, barbed wire injuries, keel wounds, caught-by-cat (CBC) flesh wounds, dog bite wounds, carpal injuries, power cable injuries and bumblefoot. Many birds will suffer beak injuries during the course of their lives. The upper and lower mandible are vulnerable to trauma and will often fracture as a result. Such injuries are orthopaedic in nature and will not be discussed further in this article. 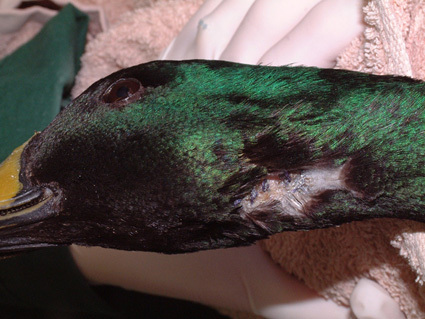 Non-orthopaedic wounds are often seen in waterfowl. The horny beak or bill (rhamphotheca) is a hard, tough, keratinised epidermal structure in birds of prey, as well as seed and grass eaters. In waterfowl such as ducks, geese and swans (Anatidae) the beak is much thinner and softer . The rhamphotheca is a modified horny layer consisting of layers of flattened keratin-filled cells, separated from the bones of the upper and lower jaws by a thin, fibrous dermis . The beak's strength is dependent on the particular arrangement conferred by a layer of keratin on a firm bed of bone. In waterfowl, and swans in particular, the soft rhamphotheca is vulnerable to trauma and easily injured. Swans fly at speeds of 30-50 mph and have difficulty making sudden changes in direction. This is probably due to a number of factors including their size and weight, as well as their relatively poor forward vision . Collisions occur regularly and can result in beak injuries . The beak will heal by a process of granulation and epithelialisation, much as with any other epidermal tissue. However, there are practical problems in that the beak will be regularly immersed under water and into food bowls. The objective of any wound management plan should be to keep the wound clean and moist to facilitate the spread of granulation tissue over the exposed bone and protect the bone from dessication. The use of a waterproof dressing is indicated. Products such as the protective paste (Orabase) are resistant to water and can be used to pack the wound cavity. Hydrocolloid dressings can then be applied over the wound to provide further protection (Figure 1 to Figure 6). Broad-spectrum antibiotics are indicated until a healthy bed of granulation tissue is established. In the case illustrated in Figures 1-6 the granulation bed was established in 20 days. Following this, epithelialisation progressed rapidly and within six days the wound was virtually healed. The rhamphotheca has a good blood supply and will heal well. This can be relied upon when performing surgery on the upper mandible. Historically, man has made use of the swan's ability to heal its rhamphotheca, though with what success remains unclear. To denote ownership by a particular individual or group of individuals, notches and patterns were cut or branded into the bill , . Today, this is viewed as inhumane and leg ringing has replaced bill mutilation as the preferred and recommended method of identifying swans in Britain. 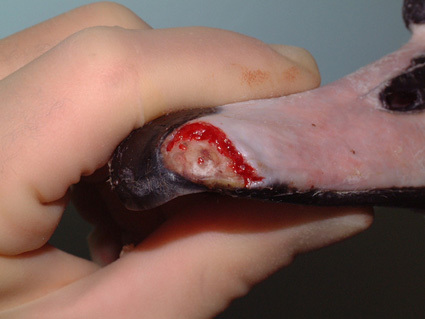 Figure 1 - An extensive wound to the tip of a mute swan's (Cygnus olor) bill has exposed a considerable amount of bone. Figure 2 - Close up of the wound in Figure 1. Fresh bleeding from a small bed of granulation tissue at the wound's proximal margin can be seen. Figure 3 - A protective paste (Orabase) was used to pack the wound depicted in Figures 1-2. Figure 4 - Several strips of a hydrocolloid dressing (Duoderm Extra Thin) were used to provide a protective barrier. Figure 5 - Bed of granulation tissue was established 20 days following admission. Figure 6 - Epithelialisation of the wound is almost complete(day 26). Head injuries are difficult to treat as the avian head shape is not easy to bandage , . Head injuries may arise following collision with a motor vehicle, window or aviary wall. They may also result from territorial disputes between birds of the same species (conspecific fighting) or as a result of attacks between birds of different species (interspecific fighting). 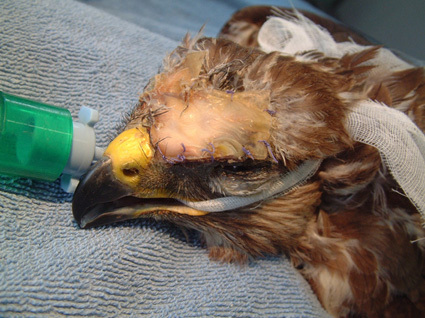 The wounds produced as a result of suspected interspecific fighting in buzzards (Buteo buteo) have been described , . The injuries can be quite severe and may involve damage to the eye, periocular tissues, oral and perioral tissues as well as the sinuses (Figure 7 and Figure 8). 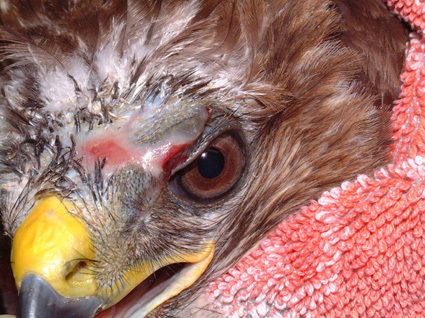 Figure 7 - Penetrating injury below the right eye of a buzzard (Buteo buteo). This injury extended into the infraorbital sinus. Figure 8 - The buzzard shown in Figure 7 also had two lacerations to the back of its head. These injuries are easily missed if a thorough examination is not made. The wounds have been cleaned under anaesthesia and dressed with a hydrogel (Intrasite) and a thin vapour permeable adhesive dressing (Opsite). The head wounds shown in Figures 7 and 8 were cleaned and then dressed with a hydrogel (Intrasite). A thin vapour permeable adhesive dressing (Opsite) was then placed over each wound. The head wounds were suitable for delayed closure after a few days. The wound below the right eye was allowed to heal by secondary intention as there was concern that penetration of the infraorbital sinus might result in complications. A broad-spectrum antibiotic (cephalexin 100mg/kg orally twice daily) was administered until a healthy bed of granulation tissue was established. The most suitable dressing for such wounds is a semi-permeable hydrolloid (eg Duoderm Extra Thin) . It is easy to use, is highly pliable and has good adhesive properties. If applied to awkward sites such as the supra-orbital ridge of a bird of prey it can be secured with sutures (Figure 9 to Figure 12). The use of moisture vapour permeable (MVP) dressings has also been advocated for the treatment of head wounds ,  because of their adhesive qualities and flexibility of the material. Whether hydrocolloid or MVP dressings are used, these should be changed every 2-4 days initially, or more often if there is excessive exudate causing fluid to leak from underneath the dressing. Once a healthy bed of granulation tissue has been established, dressings can be changed weekly . 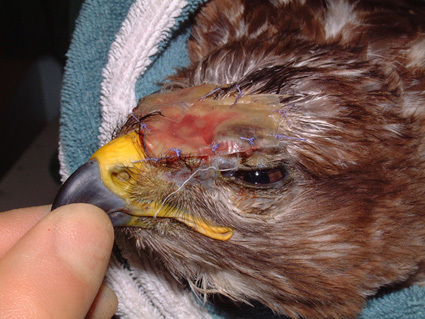 Figure 9 - Extensive head wound to a buzzard's head. A strip of hydrocolloid dressing (Duoderm) has been applied to the wound and secured with stitches. This is particularly necessary over the supra-orbital ridge. Figure 10 - Five days later the dressing is still keeping the wound moist and well protected. Figure 11 - After removal of the dressing, a good bed of granulation tissue is present. The wound to the right side of the head has almost healed. Figure 12 - After 17 days the wound has almost completely healed. A small skin deficit over the supra-orbital ridge is still evident. Five days later the wound had healed over completely. Birds caught on barbed wire are likely to struggle violently in an attempt to free themselves. Considerable soft tissue trauma is likely to result from this struggling. The barb, of the barbed wire, may only be caught in the skin, but it may also catch in and damage underlying tissues. The skin overlying the wing is thin and closely adhesed to the underlying tissues, and can be easily damaged. Damage to the tendons of the propatagial membrane and wing are especially common and are likely to be very serious, usually warranting euthanasia. The skin overlying the neck is a little thicker and moves more freely. Barbed wire injuries to the neck (Figure 13) may therefore have a better prognosis, providing the oesophagus, trachea, cervical nerves and blood vessels have not been damaged. The duck in Figure 13 was anaesthetised shortly after admission as considerable soft tissue was exposed and vulnerable to dessication. The barbed wire was firmly embedded in the skin of the neck but the key structures had escaped damage. The twisted skin was resected, removing all the compromised tissue. The wound was then closed with simple interrupted absorbable sutures (3/0 Vicryl) and a protective coating of aluminium powder applied over the wound (Aluspray). Broad-spectrum antibiotic cover was provided for seven days with clavulanate amoxycillin (Synulox) 150mg/kg orally twice daily. The wound healed uneventfully (Figure 14) and the bird was released soon after. Anti-tetanus treatment is not usually indicated, as birds are particularly resistant to tetanus toxin . 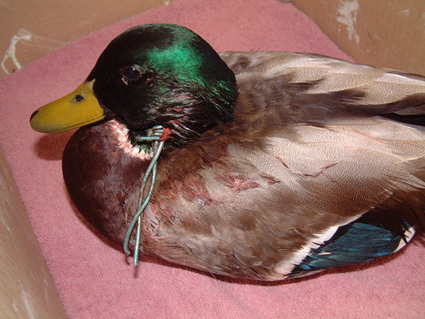 Figure 13 - Mallard duck (Anas platyrhynchos) caught on barbed wire. The barb is firmly stuck in the skin of the duck's neck. 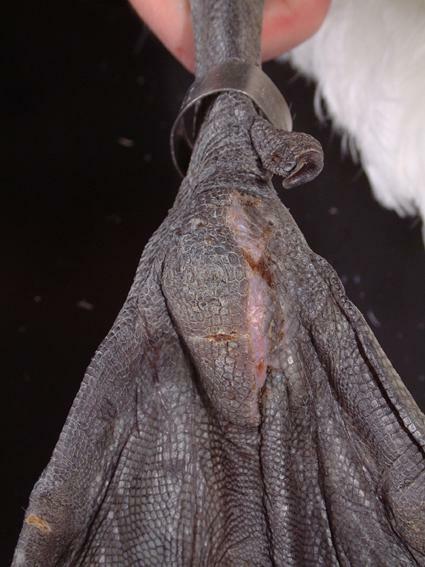 The skin has been badly torn and twisted as a result of the duck's attempts to free itself. Figure 14 - Ten days after admission the wound has healed following surgical resection of the damaged skin and primary closure. 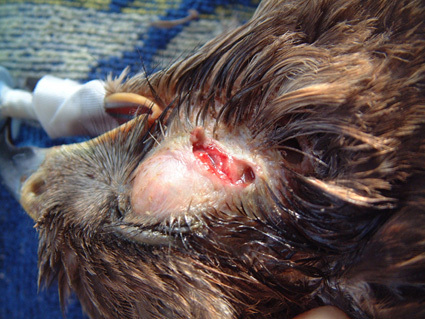 Keel wounds are usually seen in sick and debilitated birds. Such birds spend long periods sitting down and will fall heavily onto their keels through weakness. The development of a pressure ulcer is a progressive process that will eventually result in bone necrosis. Treatment will only be successful if the underlying problems are properly addressed. Procedures to deal with keel wounds and spread the weight away from the keel and onto the pectoral muscles using tubing stitched to the chest, have been described , but have met with limited success. It is recommended that treatment should only be attempted in the mildest of cases where the underlying problems are likely to improve in a short space of time. 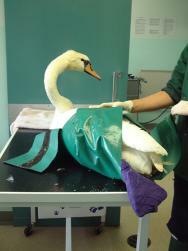 The development of a life jacket for swans, which could be strapped to the swan and inflated, may be very helpful in healing such wounds. An air filled pad down either side of the pectoral area would take pressure off the keel and distribute it more evenly over the swan's ventrum. Cat bites may range from tiny puncture wounds to lacerations. The muscle underneath a puncture wound may be lacerated due to the action of the teeth in immobile muscle (relative to the skin). 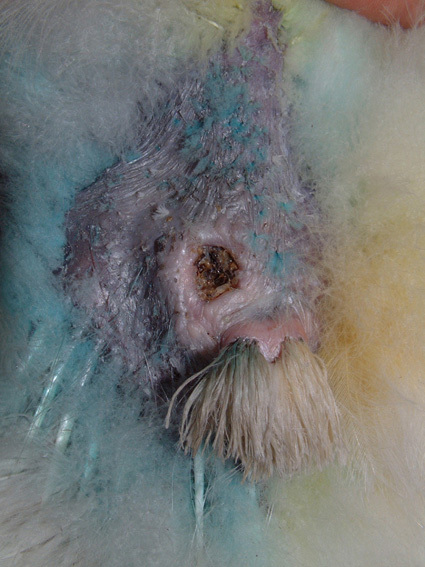 Many wounds cannot be detected with the naked eye and the need for antibiotics may not be recognised in cases where there is no evidence of a puncture wound or scratch . Septicaemia is a common sequel to a cat bite, while other routes of infection have also been suggested. Birds may ingest organisms from cat saliva-coated feathers during preening leading to gastrointestinal disease and septicaemia . Cats carry Pasteurella multocida on their gingival tissue and teeth and antibiotics are therefore always indicated in any bird attacked by a cat , . In addition to Pasteurella spp, a mixed aerobic/anaerobic population has been recovered from the majority of cat bite wounds . Selecting the right antibiotic (or antibiotic combination) is therefore of vital importance. Penicillins have been cited as the antibiotic of choice due to their efficacy against P. multocida  and their broad spectrum of action. Fluoroquinolones, such as the much-favoured enrofloxacin (Baytril) should not be used on their own as they lack action against anaerobes and provide incomplete coverage against Streptococci spp. For infected bites clavulanate-amoxycillin or combination therapy with penicillin, or clindamycin, and a fluoroquinolone is recommended. Ideally culture and sensitivity testing should be performed, but this will often be impossible for time and cost reasons. Bite wounds should be aggressively cleaned and flushed with saline or 0.05% chlorhexidine . Flushing may need to be repeated. Puncture wounds can be left open to drain but lacerations should be dressed to protect the underlying tissues. Some puncture wounds may need to be opened up to facilitate access to the underlying traumatised tissues. Where the pectoral muscles have been lacerated, aggressive cleaning and debridement is indicated under general anaesthesia. Torn, necrotic muscle should be removed and the wound packed with a hydrogel. A hydrocolloid dressing (eg Duoderm Extra Thin) can be applied over the wounds to provide additional protection. The wounds should be reassessed after 24 to 48 hours and a decision made as to whether wound closure is appropriate (Figure 15 to Figure 18). Figure 15 - This adult male blackbird (Turdus merula) had a bite wound to his left chest. The exposed muscle is dark, dessicated and necrotic. 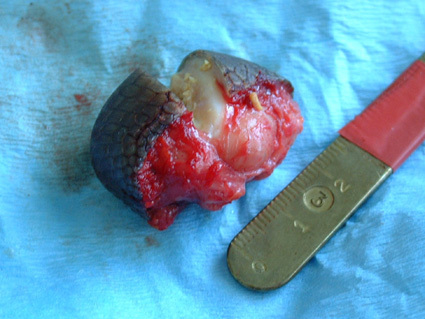 Figure 16 - Following surgical dissection and debridement of the wound, healthy muscle is visible. Figure 17 - The wounds, including a puncture wound over the lower back, were packed with a hydrogel and dressed with a thin hydrocolloid dressing. Figure 18 - A delayed (2 day) closure was performed on the wound. The superficial pectoral muscle was stitched and the skin closed. An aluminium wound dressing was applied over the surgical wound, which is shown healing 12 days later. Whilst cats are adept at catching small, usually juvenile, passerines (eg sparrows), doves and pigeons, it is not unusual for dogs to attack waterfowl who are perhaps less mobile than passerines and easier to chase. Female swans will remain on the nest despite receiving injuries to the neck and legs, while male swans will continue to defend a nest despite incurring bite wounds to the leading edge of the wing each time they strike out . A swan poses a formidable adversary and will rear up and defend itself with its wings. Consequently dogs need to attack from behind and it is perhaps for this reason that the tail and rump area is most often targeted. Some of these injuries can be very severe and vulnerable to fly strike. Infection tracks readily between the fascial layers of the tail muscles and euthanasia may be the only option in many cases (Figure 19). Figure 19 - Old, necrotic bite wounds to the tail and rump of a mute swan (Cygnus olor). Note the multiple puncture wounds and the associated lacerations. A fresh wound is likely to warrant treatment. Figure 20 shows a large adult male swan, which presented with bite wounds to both the dorsal and ventral tail. Most of the wounds healed well following careful debridement, dressing and delayed closure. One of the wounds to the dorsal tail had, however, penetrated the left preen gland. Damage to the gland capsule meant that the lipid and waxy sebum produced by the gland  was leaking into the surrounding tissues. The wound healed with a sinus (Figure 20), necessitating removal of the damaged half of the gland. Unfortunately the resulting surgical wound also broke down, leaving a deep but essentially healthy cavity (Figure 21). This was left to heal by secondary intention. The cavity was packed with a protective paste (Orabase) and a small piece of hydrocolloid (Granuflex) was applied over the wound and secured in place with staples. Wound dressings were performed with the swan conscious, thus reducing the need for repeat general anaesthetics. The wound healed uneventfully and the bird's waterproofing appears unaffected. 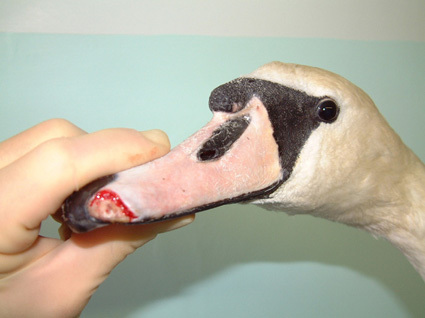 Figure 20 - Necrotic sinus over left preen gland in a mute swan (Cygnus olor) with a number of bite wounds to the tail. 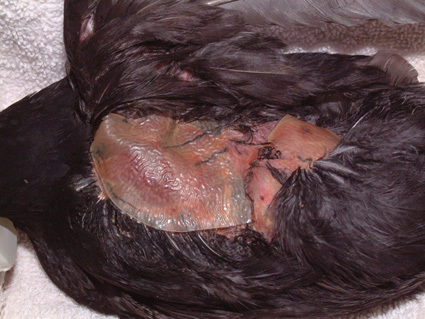 Figure 21 - Following removal of half the preen gland, the wound broke down leaving this large cavity. Figure 22 - The cavity was packed with a protective paste (Orabase) and dressed with a hydrocolloid dressing (Granuflex). This was secured in position with surgical staples. Trauma to the skin and tissues overlying the carpal joint can easily lead to complications. Tendon sheath infections and joint infections are very serious and appropriate wound management techniques are indicated to ensure that carpal injuries do not lead to complications. The anterior surface of the carpal joint is subject to considerable movement every time the joint is flexed and extended. Debridement of any wounds must be followed by treatment with an appropriate dressing. A hydrocolloid dressing (eg Granuflex) can be applied and stitched into place . It may be possible to perform a delayed closure of the wound, tissue tension permitting. In such cases a hydrocolloid dressing (eg Granuflex) may be applied over the stitched wound to provide additional protection and support. 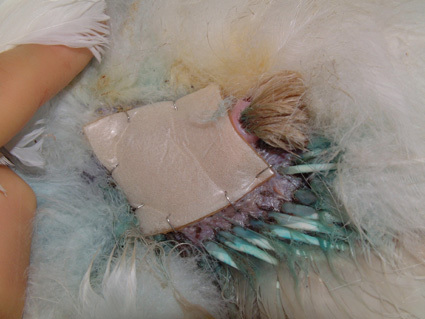 Use of absorbable suture materials can allow flighty birds to be placed in a quiet aviary, or even released, and the dressing allowed to fall off. This is only recommended in exceptional circumstances, however, as wound re-examinations are essential if complications, such as wound breakdown, are to be identified. Initially, the wing may benefit from immobilisation with a figure of eight dressing. The wing should not be strapped for more than five days, however, as tendon contracture is likely to occur and will seriously damage the bird's chances of a successful rehabilitation. One of the obstacles that swans may crash into is the power cable . Collisions of this nature are likely to result in injuries to the neck and to other parts of the body. Injuries will not only arise as a result of the initial impact on the line, but also as a result of the subsequent crash-landing . Electrical burns will occur where contact has been made between two wires. 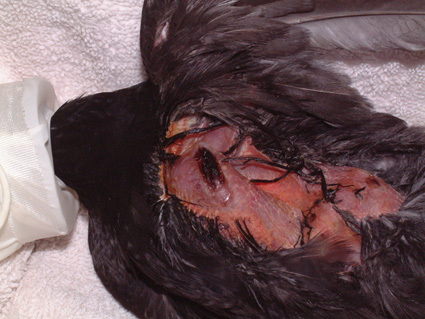 The manifestation of electrical injuries can be insidious  and all birds found adjacent to power lines should be thoroughly and repeatedly examined for signs of burns to the feathers, skin or musculature over a period of up to five days. Devitalised tissue will become cold and oedematous to the touch, before sloughing in a compartmentalised fashion, delineating the tract along which the electricity travelled . The considerable associated tissue damage accompanying such electrical burns (Figure 23 to Figure 24) will dictate euthanasia in the majority of cases. 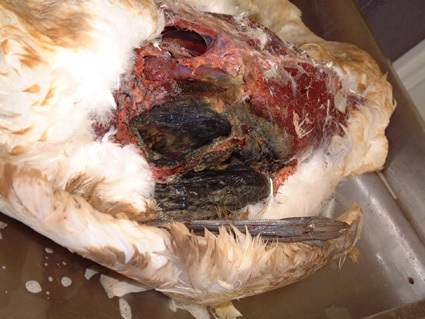 Figure 23 - Severe electrical burns to the left leg and abdomen of a mute swan (Cygnus olor) found near power cables. Euthanasia is indicated in all such cases. 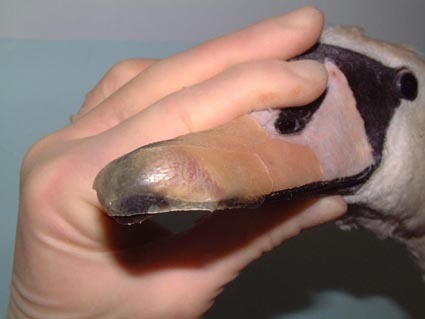 Figure 24 - Suspect electrical burns to the feet of this mute swan carry a poor prognosis due to the likely tendon and joint involvement. Note the severe blistering of the foot webs. Uncomplicated foot injuries may be treated with some success. Trauma to the foot when hitting a wire, motor vehicle or other object in flight can produce wounds (and fractures) to the dorsal surface of the foot and lower leg. Knuckling over of the foot on impact, when hitting such objects, can produce severe trauma to the integument over joints . Closure of these injuries can be hampered by lack of tissue, but supporting the foot with a swan shoe, for example, can help (Figure 25). Figure 25 - Mute swan (Cygnus olor) wearing a 'swan shoe'. A triangular plastic board is strapped to the plantar surface of the swan's heavily padded foot. This keeps the toes spread out and splints the whole foot. It is indicated for fractures of the phalanges and injuries of the foot. Surgery for bumblefoot or pododermatitis in the bird of prey has been described in detail by a number of authors , . 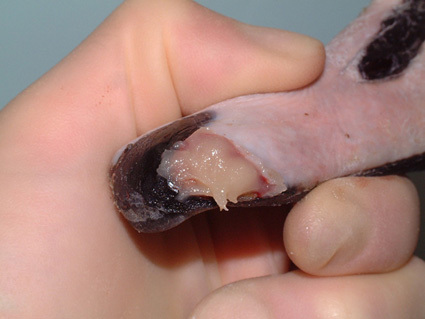 The removal of a fibriscess (Figure 26) from the plantar aspect of the tarsometatarso-phalangeal joint of a mute swan is described here. Figure 26 - Mute swan (Cygnus olor) foot with a large fibriscess on the plantar surface of the tarsometatarso-phalangeal joint. The large fibriscess was impairing the movement of the swan. An old puncture wound can be seen. Following induction of general anaesthesia and surgical preparation of the foot, the line of least tension was identified and a linear incision made over the fibriscess. A tourniquet was used to minimise blood loss. 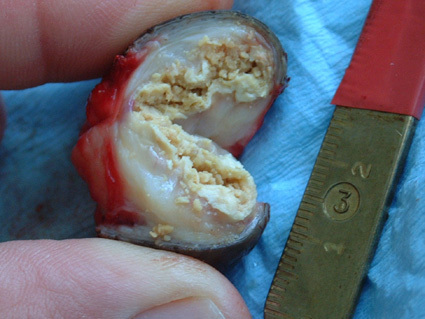 The encapsulated mass was dissected away from the underlying tissues by blunt dissection and removed as an entire mass (Figure 27 and Figure 28). This is important if the surgical site is not to be contaminated, but may be difficult where a thick fibrous wall has not had time to form around a focus of infection. The skin was then closed with a series of monofilament absorbable (3/0 PDS) mattress sutures as these are less likely to lead to infection in the wound or produce tissue reaction. Monofilament sutures provide a greater duration of wound support, which can be useful in slow healing tissues such as the thick horny layer of pedal skin. Aluminium powder (Aluspray) was applied to the wound and dressed using a swan shoe. The sutures were removed after 12 days (Figure 29). Premature removal of the sutures should be avoided as the wound can easily break down if loaded. Figure 27 - The excised fibriscess: the dorsal surface has been dissected from the underlying tissues without breaking the capsule. Figure 28 - The excised fibriscess has been cut open to show the necrotic centre, surrounded by a thick fibrous capsule. Figure 29 - Fourteen days after the excision of the fibriscess, the surgical wound has healed, leaving a pink scar of young epithelial tissue. Wound management for the avian wildlife casualty is complicated by the large number and diversity of species seen, together with the wide range of presenting problems. 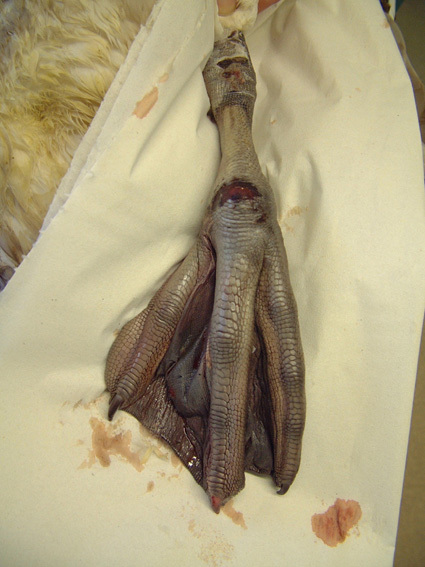 A number of avian wound problems, commonly seen in the wild avian casualty, have been discussed. This is not an exhaustive list of wound problems but serves to illustrate the techniques that can be used to successfully deal with and manage some of the more common presentations. The vast majority of soft tissue injuries will require healing by second intention. The use of hydrocolloid and moisture vapour permeable dressings has greatly improved the quality of avian soft tissue wound management, decreasing wound healing times and complications. 1. Kaplan JZ. Acceleration of wound healing by a live yeast cell derivative. Archives of Surgery 1984; 119: 1005-08. 2. Swaim SF, Wilhaf D. Topical wound medications: a review. Journal of the American Veterinary Medical Association 1985; 190: 1588-93. 3. Degerenes LA, Redig PT. Soft tissue wound management in avian patients. In: Raptor Biomedicine. Redig PT, Cooper JE, Remple JD, Hunter DB, editors. Minnesota, USA: University of Minnesota Press, 1993. 4. Degernes LA, Talbot BJ, Mueller LR. 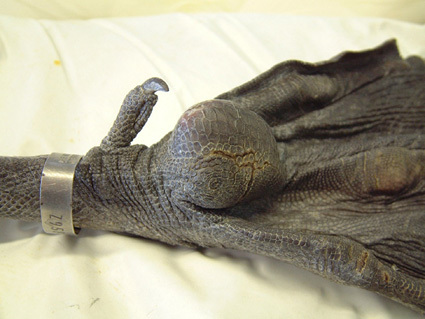 Raptor foot care. Journal of the Association of Avian Veterinarians 1990; 4: 93-95. 5. Anderson D. Wound management in small animal practice. In Practice 1996; 18: 115-28. 6. Bojrab MJ. Handbook on Veterinary Wound Management. Boston, MA: Kendall, 1981. 7. Mayaud N. Teguments et phaneres In: Traite de Zoologie. Grasse P, editor. Paris, France: Masson, 1950; 15. 8. Spearman RIC, Hardy JA. Integument In: Form and Function in Birds (Volume 3). King AS, McLelland J, editors. London: Academic Press, 1985; 1-52. 9. Beer JV, Ogilvie MA. Mortality In: The Swans. Scott P, The Wildfowl Trust, editors. London: Michael Joseph Ltd, 1972; 125-42. 10. Routh A. Veterinary care of the mute swan. In Practice 2000; 22: 426-43. 11. Dawnay A. Exploitation In: The Swans . Scott P, The Wildfowl Trust, editors. London: Michael Joseph Ltd, 1972; 167-80. 12. Ticehurst NF. The Mute Swan in England. London: Cleaver-Hume Press, 1957. 13. Degernes LA. 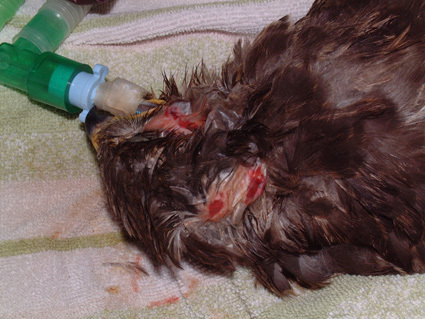 Trauma medicine In: Avian Medicine: Principles and application. Rithie BW, Harrison GJ, Harrison LR, editors. Florida: Wingers Publishing, 1994; 417-33. 14. Cousquer GO. Territorial fight wounds in wild eurasian buzzards (Buteo buteo): presentation and suggested treatment. In: Proceedings of the BVZS 2002 Autumn Conference. Edinburgh, UK, November 2002; Edinburgh, UK. 15. Simpson VR. Causes of mortality and pathological conditions observed in common buzzards (Buteo buteo) in Cornwall. In: Proceedings of the 1993 European Conference on Avian Medicine and Surgery, March, 1993; NVDV, AAV, Utrecht, The Netherlands. 16. Gerlach H. Bacteria In: Avian Medicine: Principles and application. Rithie BW, Harrison GJ, Harrison LR, editors. Florida: Wingers Publishing, 1994; 968. 17. Risi E, Ferlaux C, Sauteur N, Le Dreanzuenec S. Traitement des plaies de brechets des canards marin hospitalises en centre de soins de la faune sauvage In: Colloque Gestion et Pathologie des oiseaux d'eau et marins, 15 ans du Centre de Soins de l'Ecole Nationale Veterinaire de Nantes, France: 20-21 October 2000. 18. Wade L. Dog and cat bites in birds: Why Baytril is NOT enough. AAV Newsletter and Clinical Forum 2002; September-November: 9-11. 19. Macwhirter P. Passeriformes In: Avian Medicine: Principles and Application. Rithie BW, Harrison GJ, Harrison LR, editors. Florida: Wingers Publishing, 1994; 1173-99. 20. Quesenberry KE, Hillyer EV. Supportive care and emergency therapy In: Avian Medicine: Principles and Application. Rithie BW, Harrison GJ, Harrison LR, editors. Florida: Wingers Publishing, 1994; 482-16. 21. Coles BH. Avian Medicine and Surgery. Oxford: Blackwell Science Ltd, 1997. 22. Cooper JE. Birds of Prey: Health and Disease. Oxford: Blackwell Science, 2002. 23. Heidenreich M. Birds of Prey: Medicine and Management. Oxford: Blackwell, Wissenschafts-Verlag, 1997.